Home » Oil and Gas » What is Shale Gas? 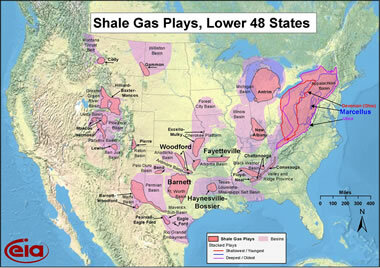 Map of the major shale gas plays in the lower 48 states, including the sedimentary basins which contain them. Click for a larger view. This video provides an overview of shale gas, starting with the first gas well near Fredonia, New York in 1821 up through January 2010 and the major shale gas plays. The speaker is John Curtis, Professor of Geochemistry and Director of the Potential Gas Agency at the Colorado School of Mines. Of the natural gas consumed in the United States in 2009, 87% was produced domestically; thus, the supply of natural gas is not as dependent on foreign producers as is the supply of crude oil, and the delivery system is less subject to interruption. The availability of large quantities of shale gas will further allow the United States to consume a predominantly domestic supply of gas. According to the EIA Annual Energy Outlook 2011, the United States possesses 2,552 trillion cubic feet (Tcf) of potential natural gas resources. Natural gas from shale resources, considered uneconomical just a few years ago, accounts for 827 Tcf of this resource estimate, more than double the estimate published last year. At the 2009 rate of U.S. consumption (about 22.8 Tcf per year), 2,552 Tcf of natural gas is enough to supply approximately 110 years of use. Shale gas resource and production estimates increased significantly between the 2010 and 2011 Outlook reports and are likely to increase further in the future. Sedimentary rocks are rocks formed by the accumulation of sediments at the Earth's surface and within bodies of water. Common sedimentary rocks include sandstone, limestone, and shale. Diagram showing the geometry of conventional and unconventional natural gas resources. Image by EIA. Click for a larger view. What is a Shale "Play"? 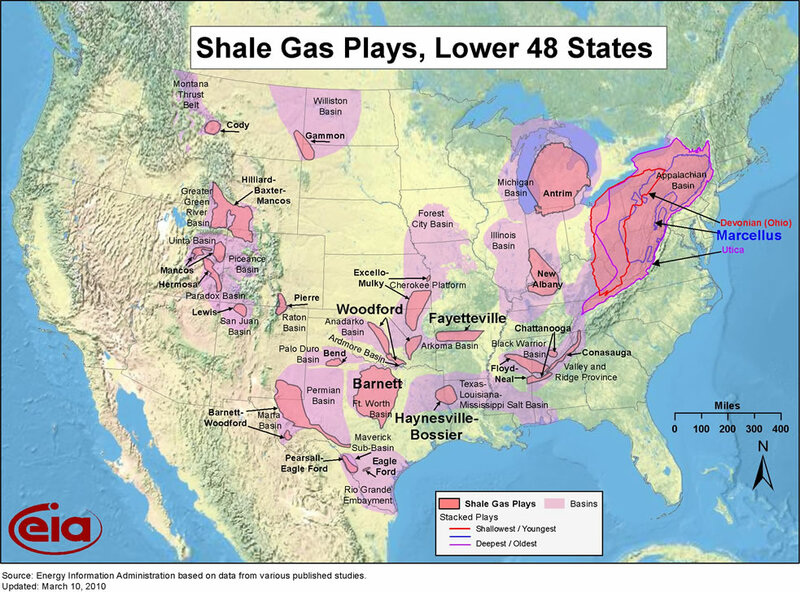 Shale gas is found in shale "plays," which are shale formations containing significant accumulations of natural gas and which share similar geologic and geographic properties. A decade of production has come from the Barnett Shale play in Texas. Experience and information gained from developing the Barnett Shale have improved the efficiency of shale gas development around the country. Other important plays are the Marcellus Shale and Utica Shale in the eastern United States; and, the Haynesville Shale and Fayetteville Shale in Louisiana and Arkansas. Surveyors and geologists identify suitable well locations in areas with potential for economical gas production by using both surface-level observation techniques and computer-generated maps of the subsurface. Two major drilling techniques are used to produce shale gas. Horizontal drilling is used to provide greater access to the gas trapped deep in the producing formation. First, a vertical well is drilled to the targeted rock formation. At the desired depth, the drill bit is turned to bore a well that stretches through the reservoir horizontally, exposing the well to more of the producing shale. 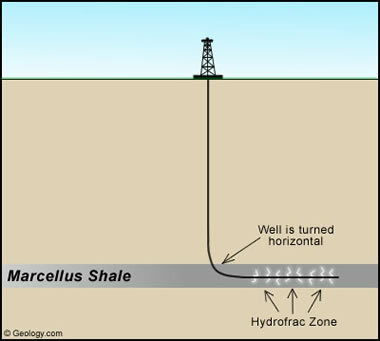 Diagram showing the concept of a horizontal well with hydraulic fracturing zone. Image copyright Geology.com. 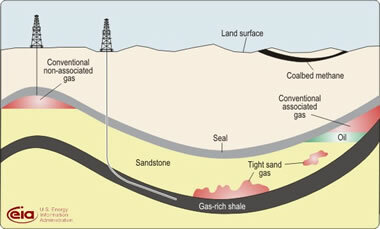 Hydraulic fracturing (commonly called "fracking" or "hydrofracking") is a technique in which water, chemicals, and sand are pumped into the well to unlock the hydrocarbons trapped in shale formations by opening cracks (fractures) in the rock and allowing natural gas to flow from the shale into the well. When used in conjunction with horizontal drilling, hydraulic fracturing enables gas producers to extract shale gas at reasonable cost. Without these techniques, natural gas does not flow to the well rapidly, and commercial quantities cannot be produced from shale. Conventional gas reservoirs are created when natural gas migrates toward the Earth's surface from an organic-rich source formation into highly permeable reservoir rock, where it is trapped by an overlying layer of impermeable rock. Conventional gas reservoirs are created when natural gas migrates toward the Earth's surface from an organic-rich source formation into highly permeable reservoir rock, where it is trapped by an overlying layer of impermeable rock. In contrast, shale gas resources form within the organic-rich shale source rock. The low permeability of the shale greatly inhibits the gas from migrating to more permeable reservoir rocks. Without horizontal drilling and hydraulic fracturing, shale gas production would not be economically feasible because the natural gas would not flow from the formation at high enough rates to justify the cost of drilling. Shale gas in 2009 made up 14% of total U.S. natural gas supply. Production of shale gas is expected to continue to increase, and constitute 45% of U.S. total natural gas supply in 2035, as projected in the EIA Annual Energy Outlook 2011. Chart showing the shale gas forcast from the EIA, Annual Energy Outlook 2011. Image by EIA. Natural gas is cleaner-burning than coal or oil. The combustion of natural gas emits significantly lower levels of key pollutants, including carbon dioxide (CO2), nitrogen oxides, and sulfur dioxide, than does the combustion of coal or oil. When used in efficient combined-cycle power plants, natural gas combustion can emit less than half as much CO2 as coal combustion, per unit of energy released. However, there are some potential environmental issues that are also associated with the production of shale gas. Shale gas drilling has significant water supply issues. The drilling and fracturing of wells requires large amounts of water. In some areas of the country, significant use of water for shale gas production may affect the availability of water for other uses, and can affect aquatic habitats. Drilling and fracturing also produce large amounts of wastewater, which may contain dissolved chemicals and other contaminants that require treatment before disposal or reuse. Because of the quantities of water used, and the complexities inherent in treating some of the chemicals used, wastewater treatment and disposal is an important and challenging issue. If mismanaged, the hydraulic fracturing fluid can be released by spills, leaks, or various other exposure pathways. The use of potentially hazardous chemicals in the fracturing fluid means that any release of this fluid can result in the contamination of surrounding areas, including sources of drinking water, and can negatively impact natural habitats.